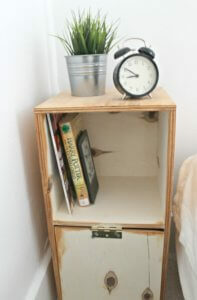 Has anyone been nightstand shopping lately? Please, oh please, tell me I’m not the only one who can’t spend $90 on one tiny piece of furniture. Times two. After we moved our king-sized bed into our tiny new master bedroom, this is all the space we had between the bed and the wall. I looked high and low for something small enough to fit the 14″ of space we had, but I just couldn’t find anything the right size. Or when I did, it cost a small fortune…yikes! If nightstand shopping taught me anything, it’s that necessity is the mother of invention. Nothing fit the bill, so I asked my husband if he thought he could build me one. Mind you, we are both amateur woodworkers, so if we can do it, so can you! I wanted something simple with clean lines to fit in with the minimalistic look we have going on in our bedroom. I also NEEDED there to be storage so we could pick up in a hurry and have a place to store our books and magazines. And toddler toys that find their way in our room, but that’s another story. I drew up a simple design that fit my demands and, in the spirit of cheap-ness, we used plywood. 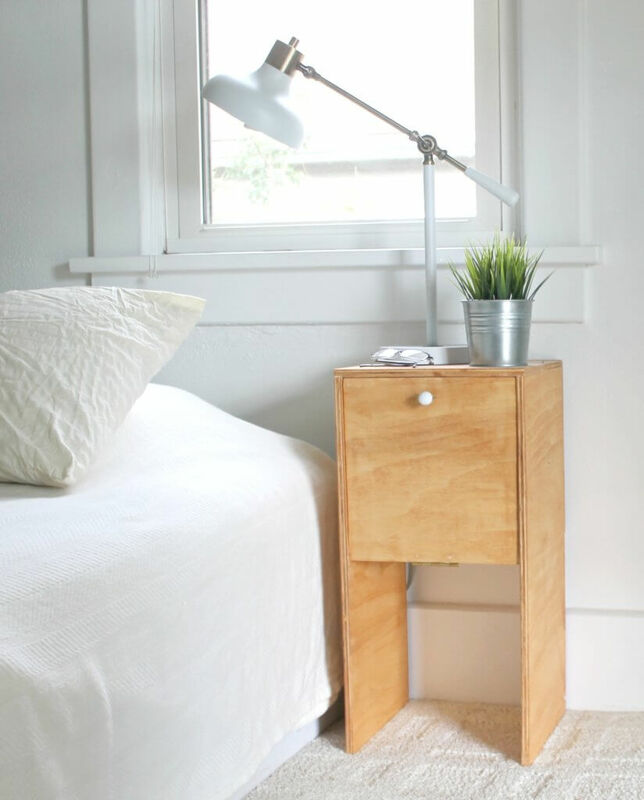 We whipped out two of these plywood nightstands in a day. We bought one large sheet of wood for $24, and it was enough to get both plywood nightstands cut out of. Honestly, all you have to do is cut out the pieces and attach them together. Add a hinge on the bottom so you can access storage. We kept this super simple (since we had no idea what we were doing, honestly) but it turned out just exactly how I envisioned. You can leave the plywood natural, as is, or you can stain it to fit your décor. Its also really easy to customize with whatever hardware you like. 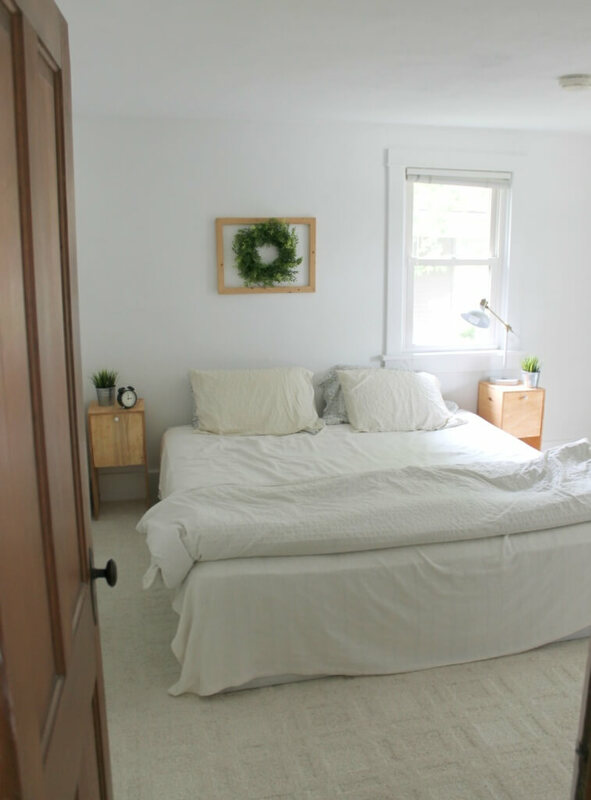 You can see the rest of our master bedroom here. 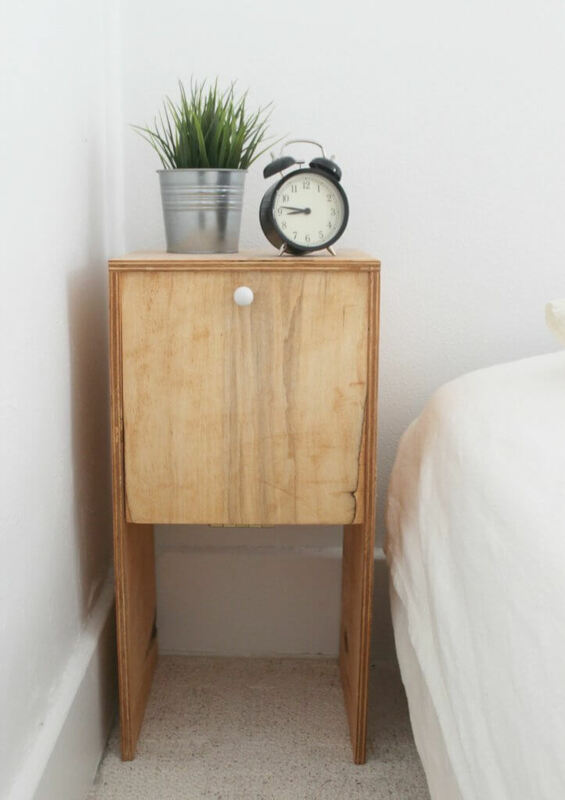 These plywood nightstands were our first attempt at DIY furniture, and we have since filled our house with many other custom pieces. It is kind of addicting–you have been warned! What do you think? Would you ever build your own furniture?